Sestriere, Italy – The Giovanni Agnelli race course in Sestriere is steeped in history. Named for the founder of Fiat and developer of the resort in the 1930s, this was the piste that sent 21-year- olds Julia Mancuso and Ted Ligety on to Olympic gold in 2006. It was here that the legendary Janica Kostelic of Croatia won three slaloms and is the site of one Kristina Koznick’s six wins. But the Audi FIS Ski World Cup hadn’t visited Sestriere’s fabled slalom pitch in 13 seasons. Mikaela Shiffrin was just nine then. Standing in the starting gate on December 11, history was not on Mikaela Shiffrin’s mind. Coming off a pressure-filled weekend at Killington and topped off with the stress of her first downhills in Lake Louise, the travel to Sestriere had taken its toll. Deep in her soul was a tiny thread of anger over the first run giant slalom lead she had lost 24 hours earlier, succumbing to the fatigue in the second run and finishing sixth. It was still enough to retain the World Cup overall lead over Swiss Lara Gut. But she had come here to win – not to give away a first run lead. In Saturday’s giant slalom, Shiffrin had taken a slim hundredth of a second lead after the first run in a field that saw only 12 hundredths separating the top five – a lead of a whisker. In the second run, that narrow margin evaporated quickly on the heels of a picture-perfect winning run by France’s Tessa Worley. But Sunday was a different day. Shiffrin started fresh – her first really good night’s sleep since the long flight from Calgary a few days earlier. In the first run, she took the lead but she knew she had more. And she also knew the girls around her – Frida Hansdotter, Veronika Velez Zuzulova and others – were closing in. As she pushed out onto her second run, the Olympic champion initially lost ground. But after the first timing split, she found her groove. For every ounce of speed, she just wanted more. And it came! 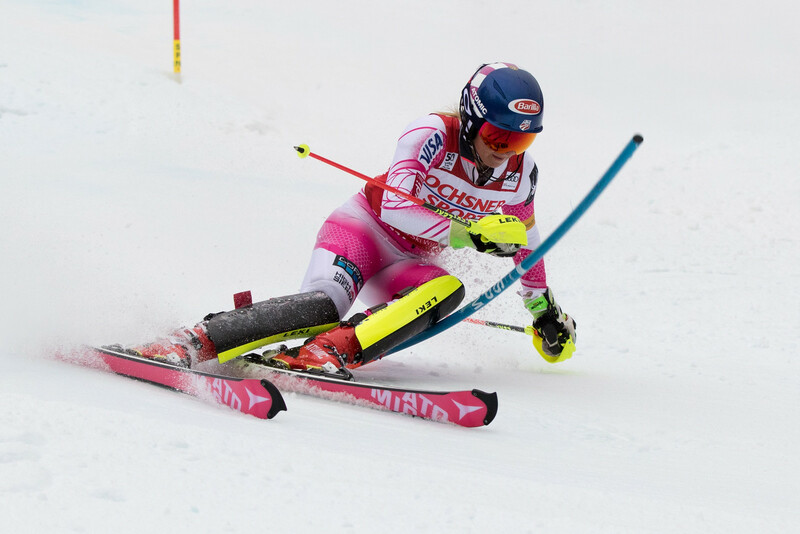 There was a certain irony surrounding Shiffrin on Sunday. A distant 13 seasons earlier, a young Austrian stood in that same starting gate gazing down the Agnelli track. She would win her first World Cup that day, defeating American Sarah Schleper. And she would go on to become the inspiration for the budding young Mikeala – Marlies Schild. 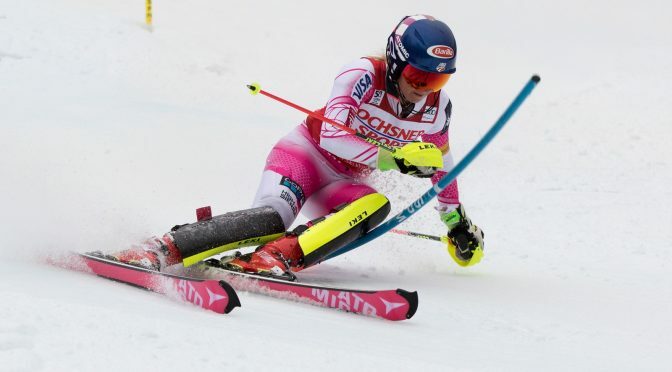 In her short but productive tenure, Mikaela Shiffrin has become known for many things, not the least of which is humility. To the frustration of the photographers, she’s not prone to celebrate her victories with wild gyrations and leaping into the stands. Maybe you get a smile. But mostly you get respect. This day was different. She had come here to win – but it really wasn’t about that. As she crossed the finish, time stood still for a moment. Somehow she gained nearly six-tenths of a second in the final 20 gates. She looked to the scoreboard and knew. Then she broke into a big – really big – smile. Finally she pumped her fist in jubilation. It was a celebration of relief. Suddenly, the pressure of winning in front of her family in Killington and the fear of exploring speed in Lake Louise was behind her. This was familiar territory. She had won again. Most of all, she had found the fun in ski racing.